Name/TitleView of Shore Street from the pier head - shows Lochbroom Tweed Mill. About this objectView of Shore Street from the pier head - showing Lochbroom Tweed Mill. 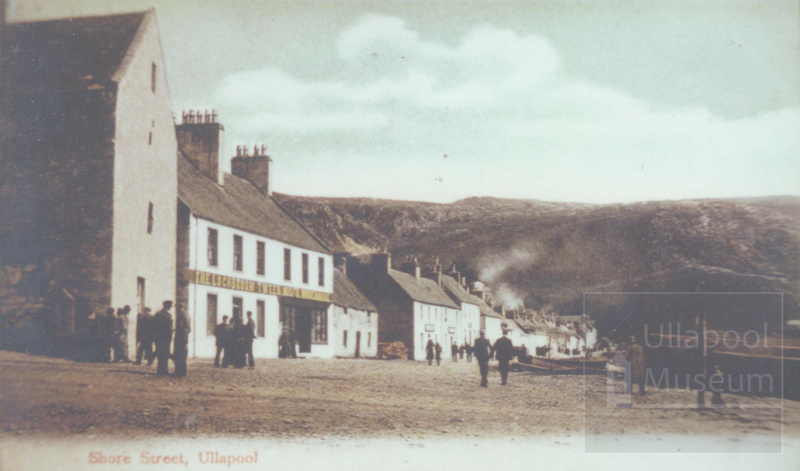 The tall building at the corner is one of Ullapool's earliest buildings, being erected soon after the foundation of the town in 1788 by the British Fisheries Society. One of its early uses was as a salt store. At the time of writing  it is in use as housing and shops. Near the corner can be seen the wooden box housing the barometer to help fishermen forecast the weather. The admiralty gave barometers to the fishing communities in the 1800s - though it is not known whether this one was given by them or another source. Note the gravel roads and no pavement.